This is a creamy, silky lotion that soaks right in without leaving any greasy leftovers or waxy film. It has PISTACHIO butter in there! You'll get hooked on this stuff. Can be used on the hands, feet, body, and even face. Each fragrance is divine! Flowers will have you smelling like roses while you smell the roses. 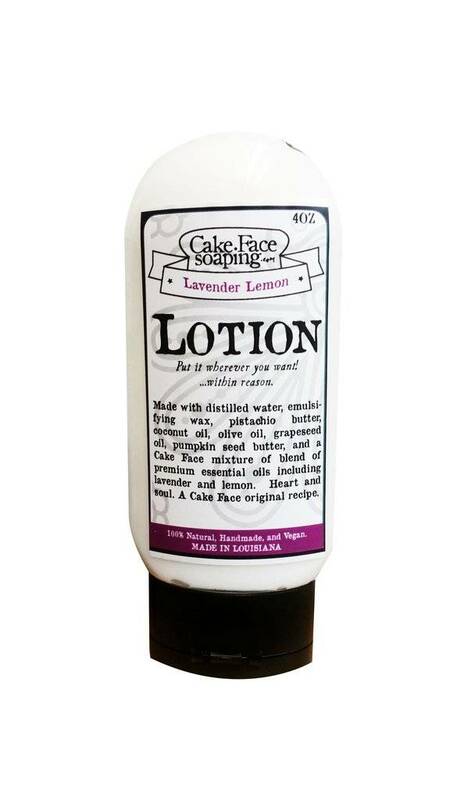 Lavender Lemon is a daily lotion that will relax your mind and soothe your skin. The Postman is a shop favorite, and can also be used as an aftershave for your favorite guy. Flowers Ingredients: Pistachio butter, fractionated coconut oil, olive oil, grapeseed oil, pumpkin seed butter, vegan emulsifying wax, distilled water. A Cake Face blend of rose, peru balsam, honeysuckle, plumeria essential oils. Heart and Soul. Lavender Lemon Ingredients: Pistachio butter, fractionated coconut oil, olive oil, grapeseed oil, pumpkin seed butter, vegan emulsifying wax, distilled water. A Cake Face blend of essential oils. Heart and Soul. The Postman Ingredients: Pistachio butter, fractionated coconut oil, olive oil, grapeseed oil, pumpkin seed butter, vegan emulsifying wax, distilled water. A Cake Face blend of essential oils. Heart and Soul.